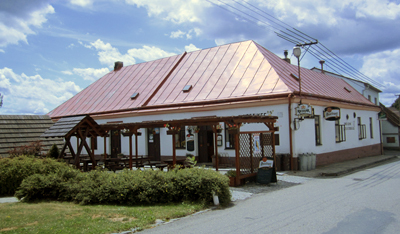 You can find accommodation in a charming enviroment, surrounded by beautiful nature of Podoubraví! Hostinec U Bambuchů offers accommodation in its newly renovated pension. We can find here 5 cozy little rooms with private bathroom and access to the kitchen and common room. Free WIFI is available in the whole area. This room gives you a nice view of the picturesque square of Libice. In this room, three people can be accomodated. Extra bed is available. Guests can use s small table with chairs and shelves for their things. The bathroom with a shower is set in the hall, but is intended only for guests of this room. This room gives you a nice view of the picturesque square of Libice. In this room, three people can be accomodated. Extra bed is available. Guests can use s small table with chairs and shelves for their things. The bathroom with a shower is set in the hall, but is meant only for guests of this room. Room no. 3 is meant for two people. Guests here will have nice view of the village Libice and countryside. The room has a bathroom with a shower. The room is located in a separate building, a few meters from the restaurant. Together with room no. 4 and no. 5, there is possibility to use the common room and kitchen. Room no. 4 is meant for two people. Guests here will have nice view of the village Libice and countryside. The room has a bathroom with a shower. The room is located in a separate building, a few meters from the restaurant. Together with room no. 3 and no. 5, there is possibility to use the common room and kitchen. Room no. 5 is meant for two people. Guests here will have nice view of the village Libice and countryside. The room has a bathroom with a shower. The room is located in a separate building, a few meters from the restaurant. Together with room no. 3 and no. 4, there is possibility to use the common room and kitchen. These places are suitable for family holidays, seminars, conferences, celebrations. In the whole area there is WIFI free. We also welcome your pets (by appointment). Book your accommodation at tel. : +420 774 929 635 (or . : +420 569 621 269, +420 602 625 966) or on the website HERE. You can also book the accommodation directly in pension.